Say you have protected the print either by placing the wall hanging under glass or by applying a protective coating, or you don’t wear your scarf in daylight any more than necessary. You have done all you can. But other atmospheric effects are also present. Even in the cleanest home and business environments the air is filled with tiny dust particles. Over time these are collected by, and built up on, whatever is in that environment. The car gets dusty. You know furniture must be dusted. The floors must be vacuumed. A hair dryer with no heat can blow the dust away – probably the best method for wall hangings. Sure, all you have done is move the dust, but it is a gentle way to get it off the silk. If you prefer, you could simply shake it gently to eliminate most dust. The archival life of the ink has been tested to be up to 400 years if it is kept out of the light. Or for well over 75 years under glass. Your scarf can safely be ironed with a steam iron at 'silk' setting to remove any wrinkles or after hemming the edges. Silk loves steam and is part of the process of making the fabric. I usually iron from the backside, mainly to avoid mashing down the rolled hem. In the event your print has been used as a fashion accessory, it could in time become necessary to clean it. 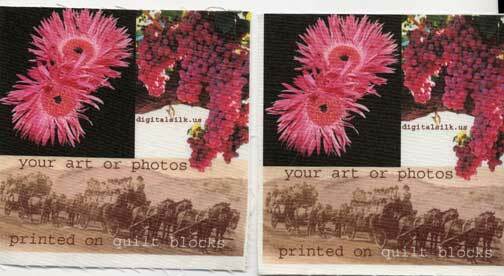 The printing 'ink' is actually archival pigment and can be hand-washed with care. See picture here of a print that has been washed. The print on the left has been washed. No details were lost in the print. You can see a bit of 'fray' on the edges of the left image. When your silk print has been hemmed, as for a scarf, this will not happen. There is also a small amount of shrinkage vertically. It is a common conception that one must dry clean silk. This is not necessarily so. There are different dry cleaning processes and not all are gentle enough for silk. The manufacturer of the silk sold on this site states never to dry clean the product. It is not because of the ink, nor the raw silk, but in the process of making the silk printable they have a disclaimer. Dry cleaning is not 'dry'. Liquid chemicals are used for cleaning. The chemicals used can be too harsh or toxic for silk which is an 'animal' product, not a 'vegetable' product like cotton or synthetic like polyester. The cleaner will press the scarf with their commercial machines and the hems will be compressed and not appear hand rolled any longer. That said, if the garment you purchase indicates to dry clean, then that item may be safely cleaned in that manner. I tested dry cleaning scarves I have printed and they came out OK. Two people I have spoken with had the prints fade remarkably at the cleaners. They did not say where they bought the prints that faded, and I don't know the difference in the chemicals of the dry cleaning, so just a strong warning. Hand washing is the acceptable method to clean. scarves from Digital Silk. IMPORTANTAlways handle wet silk very gently. Don't rub the surface or wring the scarf. Silk is very strong but the fibers are weak when wet. Use a liquid hand soap or shampoo. Lay flat to dry. press with steam iron when dry. When rinsing or washing the silk, use a solution of SEA SALT in COLD water not plain water. Use 3 or 4 Tablespoons of sea salt per gallon. It must be sea salt, not common table salt. And the water should be as cold as possible. Most fabrics will shrink a bit when washed. This is why dressmakers will 'pre-shrink' the fabric prior to cutting out the pattern. If your print is a scarf, you likely will not notice any change in proportion at all if it is washed. However, be aware that chiffon shrinks considerably expecially in one direction, and becomes a tighter weave. This means it will no longer be completely in proportion as it was in the beginning and will not be as transparent as it was due to compacting the threads of the weave due to the water. If you get a stain on the silk, as soon as possible get the silk wet - the entire piece not just the spot or it might leave a ring - then apply some dishwashing detergent such as Ajax or Dawn that has a grease removing agent on the stain. Don't rub the stain, just let the spot soak in the detergent a few minutes and the stain should disappear. If it doesn't, then gently rub the spot. Take extra care if the silk is white or pale plain color. FOR FURTHER COMPREHENSIVE INFO ON CARE OF SILK , FOLLOW THIS LINK.